Ethnographic Museum of Bourgas is situated in the city center. Host of the museum is a beautiful two-storey building built in the 19th century. 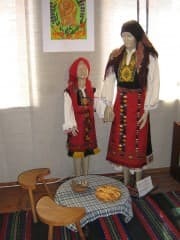 The museum exposition is presented in several zali.Tuk you will see an extraordinary collection of folk costumes from all ethnographic groups of representatives of the Burgas region. On the first floor of the museum has presented traditional town house interior, a representative from the late 19th and early 20th century. There are also authentic Viennese style in furniture, works of our master craftsmen. Exposure on the second floor introduces us to life and urban culture of people of Burgas to the late 19th and early 20th vek.Predstaven is typical for the Bourgas region, horizontal loom and authentic standards for weaving belts. You see, beautiful tablecloths, rugs and unique lace-knitting of cotton and wool socks and more. All handmade by burgazliyki. The elegance of the local women is reflected in those formal ladies wear. 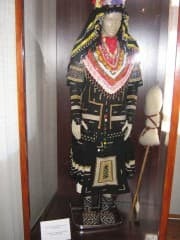 In the ethnographic museum are exhibited and original ritual costumes associated with love and fairs in the Burgas region, everyday women's clothing, wedding dress and groom suit from Strandja is preserved and original Midsummer bride dress of the 19th century. Impression you will make a unique collection of mummers, and lazarski carol costumes. Ethnographic Museum is a subsidiary of Regonalen Historical Museum Burgas. The doors of the museum are open to visitors year round.